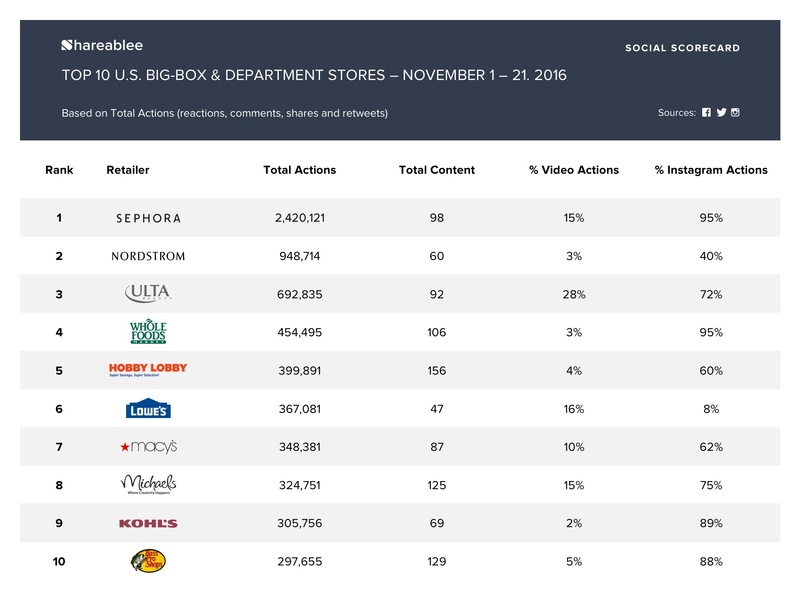 New York, NY, November 22, 2016	(Newswire.com) - ​Shareablee, the leading provider of total audience measurement on social media, today released the Black Friday Retail Brand Edition of its Social Scorecard, ranking consumer interest in U.S. retailers in the countdown to the biggest shopping season of the year. The ranking reflects 380 million consumer interactions for the retail category in November 2016, down 20% from 2015. Sephora is outperforming all other retailers on social media this year, with 2.4 million consumer interactions (reactions, comments, shares, retweets, favorites) across Facebook, Twitter and Instagram. This is largely being driven by its success on Instagram, revealing high consumer enthusiasm for their offerings of makeup box sets and key brands such as Bite Beauty and Urban Decay, as well as their own collection. New to the Shareablee Social Scorecard Top 10 are Hobby Lobby (276% growth over last year), Lowe’s Home Improvement (up 947%), Michaels Stores (up 68%), and Bass Pro Shops (up 74%), reflecting renewed consumer enthusiasm for the DIY and Home Improvement space. Luxury Retailers and big box retailers Bergdorf Goodman, Barneys, Homegoods (down 74%), all dropped from the top ten list this year, with declines of 39%, 50%, 74% respectively. Major retailers Target, Walmart and Best Buy were also notably absent, driving just 338,000 consumer moments on social in November, and declining by more than 50% year over year. “The consumer is much more skeptical of the retail season this year, and are rewarding only those retailers truly making an effort to be authentic and to add value to their shopping and research experience in the lead-up to Black Friday. The Black Friday story this year is being driven by niche stores and online-only retailers, who for the first time are dominating the traditional big box players in a huge way - which will have major long term impact on brick-and-mortar sales,” said Shareablee CEO and Founder, Tania Yuki said. Nordstrom has the top Black Friday posts on Facebook, earning the brand nearly 544K social actions in November. 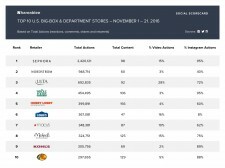 Amazon wins on Twitter capturing over 9K retweets and driving the most social actions for the U.S. retail category in November. Nordstrom wins audience loyalty with 40% of the brand's Facebook audience returning month over month to engage with the brand. Shareablee is the first and only industry-level measurement solution for media companies and brands wanting to understand the impact and effectiveness of their cross-platform social media campaigns. The platform is now available globally, with clients in 15 countries worldwide. Shareablee captures real-time interactions of more than 800M consumers against its global dictionary of brands, publishers, TV shows, influencers, celebrities and more. The company marked its third anniversary in February with 300 percent revenue growth in 2015 and 200 clients. Shareablee's roster of platform clients consists of many industry leading media companies and brands, including the NBA, Warner Bros, P&G, Hulu, NBC, AOL and Luxottica. The platform also includes subscribers from leading advertising agencies represented by Publicis, WPP and Interpublic Group. In April 2015, Shareablee was named a Unilever Foundry Award winner, and in May 2015, the company was listed among EContent's Trendsetting Products of 2015. In September of 2016, Shareablee was named an official Facebook Media Solutions Partner. For additional information please visit www.shareablee.com.